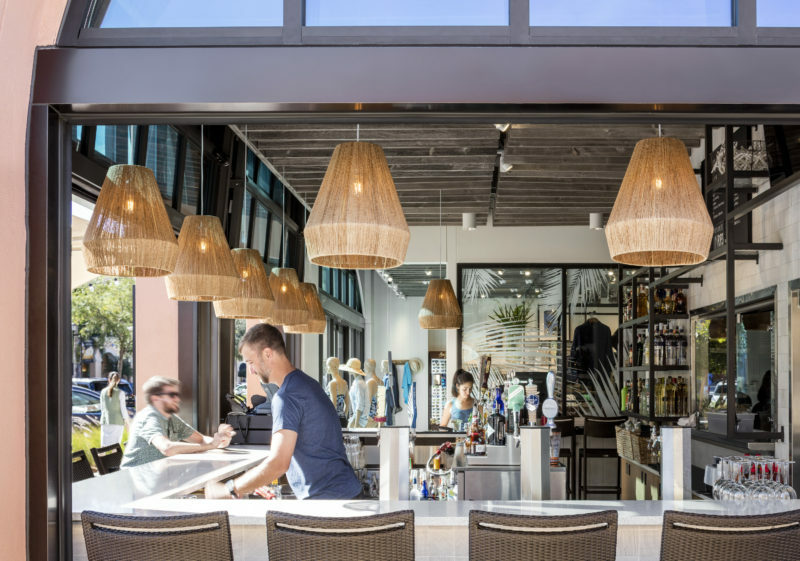 Restaurant goers are hearing the siren call to the outdoors, with customers feeling the desire to connect to the street as well as the farm. It is summer time and we’re all yearning to get outside! Coincidentally, restaurant goers are also hearing the siren call to the outdoors, with customers feeling the desire to connect to the street as well as the farm. So how do our F&B concepts respond to this need? New designs reflect increased openness to the city environs as well as the need to bring nature into the dining room. The lure of street food experiences and more pedestrian customers has created the demand for more walk up windows. Mimicking the food truck experience, takeout windows are proliferating at a variety of restaurants. As cities get denser, the yearning for greenery grows and living walls within restaurant interiors have become a popular backdrop. Dense green walls in interior dining spaces create a connection to nature. The eating experience has also evolved as customers want more choices of when, how and what they want to eat. Uniquely curated food experiences are catching on. This has led to the growth of high-end food halls that incorporate non-franchised dining and pop up events. Food halls also have a farmer’s market component that sells groceries directly as well as connecting chefs with farmers to serve fresh, local fare. Food halls serve as community gathering places that become part of the city fabric. Walk up windows are popping up as people demand more quality take-out food options. Dining has become more informal and customers want street eats they can also take home or back to work. The “window” has become a design element where signage and the canopy can provide a pop of color or graphics on an otherwise closed façade. This window can also act as a magnet and advertisement to the street for the sit down restaurant. Living walls are proliferating in restaurant dining rooms with the rise of green design and sustainability. A wall of plants creates a living breathing décor element connecting diners to nature. A well maintained wall of plants creates a tranquil and lush backdrop that can absorb sound in a busy dining room. The feeling of eating outdoors all year round holds universal appeal. Some restaurants are using these walls as food gardens where chefs can harvest herbs served in dishes on their menu. The connection to farming and dining is increasingly important and this visual connection reinforces that. Food halls are not a new concept. The model goes back as far as ancient times with Middle Eastern bazaars. Europe has had continuity of urban food halls for centuries. Public markets in the United States gained ground in the nineteenth century and were funded by cities as a place for all citizenry to gather, shop and eat. 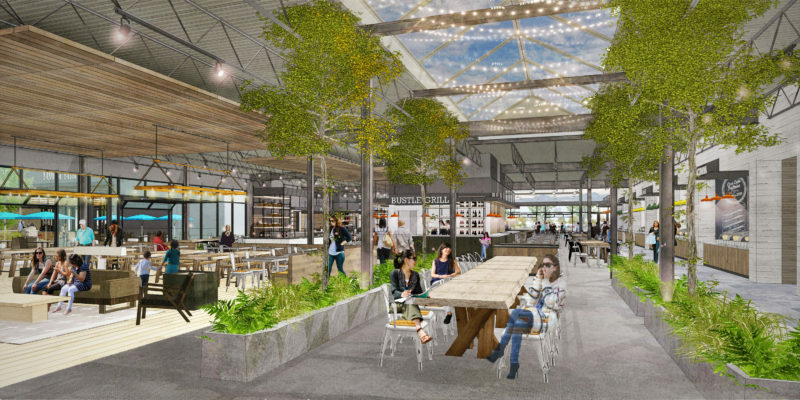 The current trend of high-end food halls is a desire to bring local chefs, artisans and farmers together into a dynamic marketplace where people can meet. 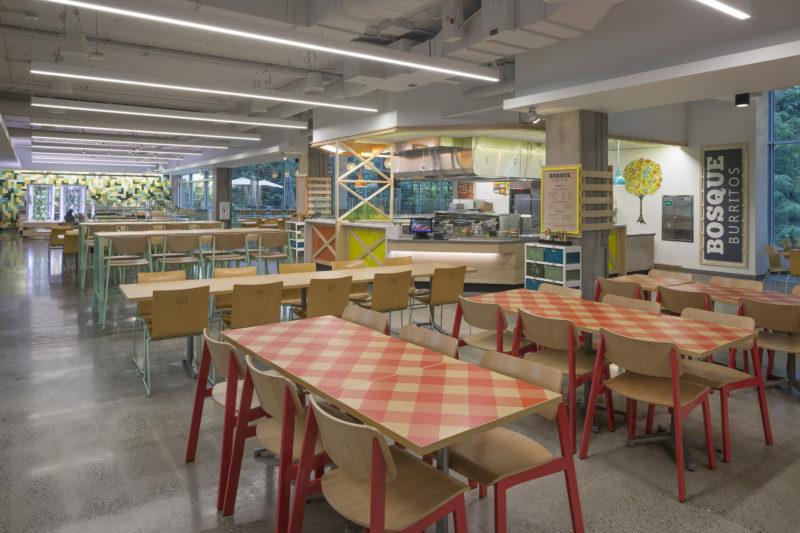 The food court prototype in a suburban mall has also moved to urban spaces and embraced diversity and quality dining. Food halls are often community hubs where people can watch cooking demonstrations, shop and eat a variety of local foods. The emphasis is on choice and taste and less on convenience. Food halls are being created in renovated historic buildings, new buildings and re-purposed suburban malls. They are programmed in individualistic ways that connect back to the local culture and community. Considering these trends, I’m looking forward to seeing what’s next in restaurant design. I’m picturing a net zero restaurant with ultra-high efficiency appliances, electricity powered by rooftop photovoltaics and waste heat loops that recover and recirculate excess heat from refrigeration to use as space or water heating. McDonald’s released a study in 2015 that looked at the possibility for model net zero restaurants in three U.S. cities. The company’s findings indicate it is achievable and teams are investigating the model for future development. Some key design features might include moving art walls powered by solar generation, kinetic sculpture / signage on the exterior could be wind or solar powered with ultra-efficient appliances showcased in open kitchens. It’s an exciting time to be in F&B design!